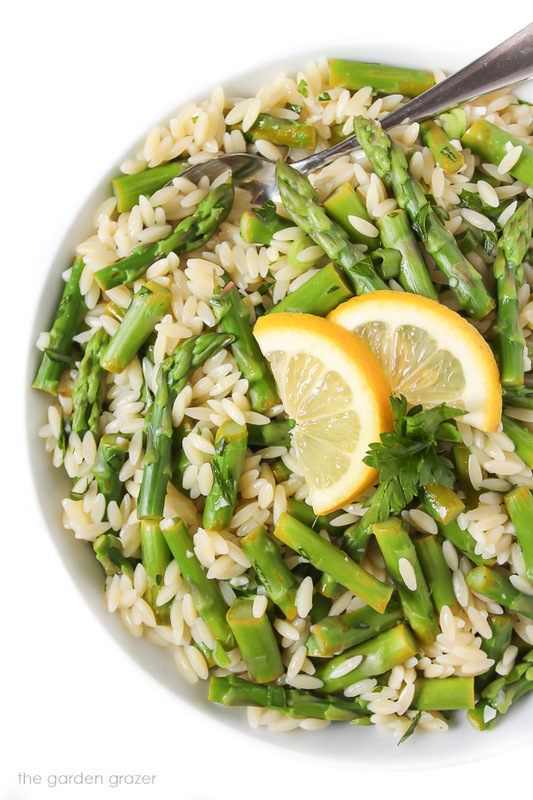 EASY 6-ingredient Lemon Garlic Orzo with Asparagus! A lovely spring side dish with a pop of fresh flavors and it only takes 20 minutes to prepare. Happy Spring! 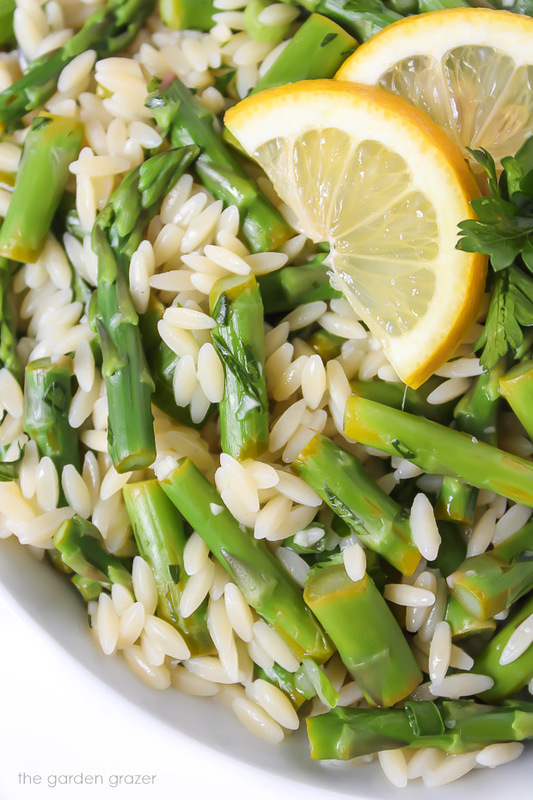 Let’s take a moment to celebrate asparagus back in season – woo! I absolutely love the fresh, new flavors that each season brings. And this easy side dish highlights one of spring’s finest with only 6 simple ingredients & 20 minutes to prepare. I lightly steam my asparagus, but it definitely works with whatever your go-to cooking method is – roasting, grilling, broiling, etc. (If you need inspiration or more guidance, here’s an article from The Spruce with 8 Ways to Cook Asparagus.) 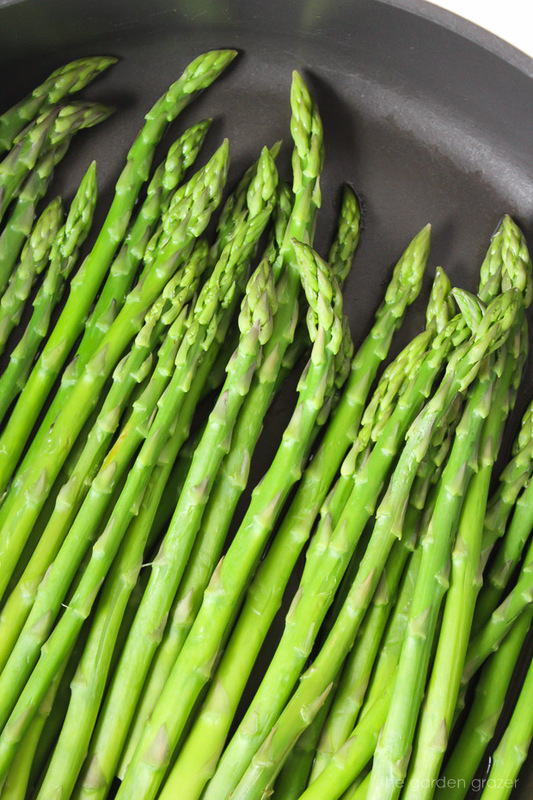 Most veggies typically dull in color when cooked, but isn’t it beautiful how asparagus actually brightens up even more when steamed? Gorgeous! It’s also worth noting that lemons vary quite a bit in size and juiciness so you may want to grab two to be on the safe side. A medium lemon usually gives about 2-3 Tbsp. juice, and a large can give about 4 Tbsp. (1/4 cup). I like to use about 1/4 cup lemon juice for this recipe (plus the optional zest for even more bright, lemony flavor) but feel free to increase/decrease the amount based on your palette. It’s such a simple dish but with bright pops of flavor from the fresh lemon, garlic, and parsley – and another easy recipe to modify to your taste so have fun! Optional: fresh basil, baby spinach, spring peas, cherry tomatoes, shallot, pine nuts, dairy-free parmesan for topping, etc. Cook orzo: in a medium saucepan, bring 2 cups water to a boil. (You can opt for vegetable broth to add more flavor.) Add orzo, stir well, then reduce heat and simmer for about 10 minutes or until tender. Drain. Place lemon juice and garlic in a small bowl, and set aside. When cooked, cut asparagus into 1-inch pieces. Roughly chop parsley, stems removed. Slice green onions. In a medium bowl, add all ingredients and pour lemon-garlic dressing on top. Toss to combine and salt/pepper to taste if desired. 1. If you have a steamer basket, steam for about 3-7 minutes, depending on how thick the stalks are. You could also grill, roast, or broil, etc. 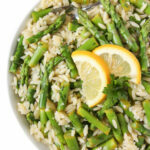 the asparagus – any will work for this recipe! Gluten-free option: use GF orzo, or substitute your favorite gluten-free pasta instead of the orzo. Yum, yum, yum! I think I may try this with risotto, as I'm not a fan of orzo. Thanks!